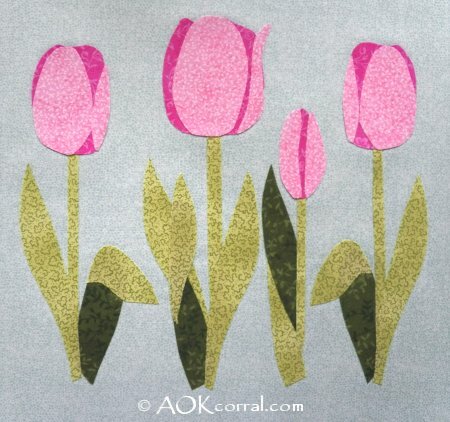 Make appliques for one tulip or a field of tulips with our tulip applique pattern set. The Easy Print Version contains all patterns for the small, medium, and large size sets and instructions. Note: Be sure to use the right fusible adhesive for your project. If you plan to stitch the edges of your appliqué, you should use a light fusible adhesive. If you do not want to stitch the edges of your appliqué and you want it to be washable then you should use a strong hold fusible adhesive. Look for fusible adhesives in your fabric store near the interfacing. Cut out all the pattern pieces for the size of tulips and leaves that you wish to appliqué. Trace each of the pattern pieces, for one fabric color, onto the paper fairly close together. To create a larger variety of leaves or flowers you can also flip over the pattern pieces and trace some of them that way for a reversed direction flower or leaf. Just remember to do this with all the pieces needed for that flower or leaf. Cut the fusible adhesive paper around the whole group of traced patterns - add extra paper area to the piece that is going onto the color you will use for making the stems. Cut out each of the pieces and peel off the paper backing. Follow steps 3 through 7 for the other pattern pieces that use different colors of fabric. 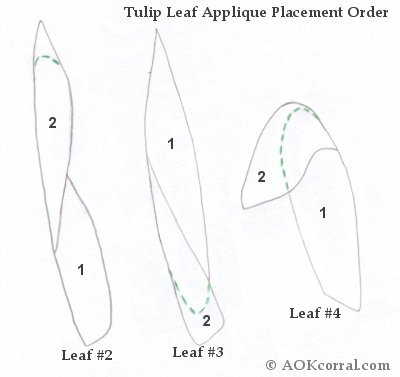 Refer to the placement guides below to see how to put together the different tulip flower pieces and the tulip leaf pieces. The order of placement is given for each. Lay out your chosen assortment of flowers onto your project and add leaves in different arrangements until it looks good to you. Carefully remove pieces from your project in groups so you don’t forget the layout, but leave one set of leaves and stem in place so you don’t lose your positioning. Follow the manufacturer’s directions for the fusible adhesive for bonding the pieces onto your project. Add each different group of leaves with stem and then follow with the flower petals. Add these great appliques to quilt blocks, table runners, pillowcases and more! © Copyright 2013 by AOK Corral Craft and Gift Bazaar. All rights reserved. *This version includes patterns for small, medium, and large size sets and instructions.